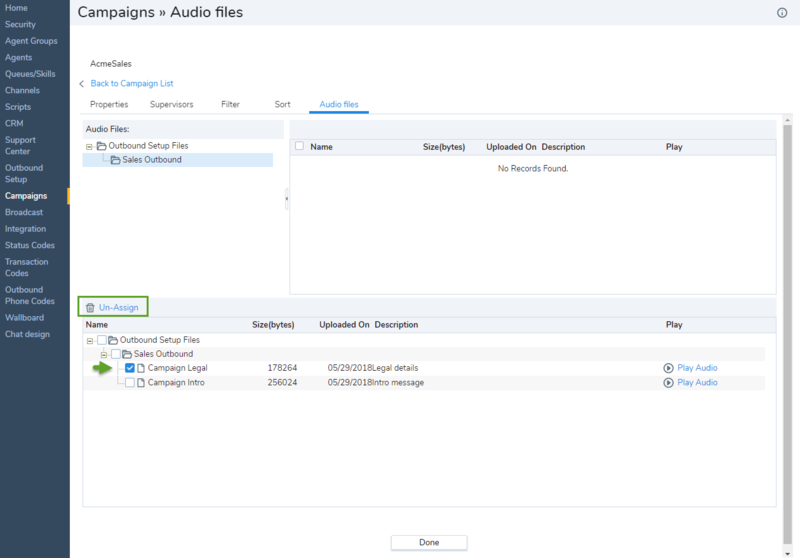 During a campaign, an agent can play pre-recorded audio messages defined for the campaign to ensure a uniform delivery of the campaign message across all campaign calls. If you uploaded audio files of pre-recorded messages during Outbound Setup, you can assign those messages to the campaign now. An agent accepting campaign calls can access and play pre-recorded messages at any point during the call. On reaching a voicemail, an agent can play a pre-recorded message, then immediately switch back to available status, and attend the next interaction. Go to Campaign > Audio Files. In the Audio Files pane, select a folder. The voice messages in this folder appear in the list. Select the voice message you would like to assign to the campaign. Click Assign above the check boxes. A dialog box appears with a message confirming the assignment. To un-assign an audio file, select the file from the Assigned Audio Files window, and select Un-assign from the menu.